Fall brings the start of classes, and for me a welcome return to my favorite university class of all. Not the ones I teach, but the student wellness course I take. In the olden days, students had a couple of required PE classes that consisted mostly of running around the track. The country club atmosphere now means students can meet their wellness requirement by exploring activities from billiards to horseback riding, yoga to rock-climbing. As a faculty member, I can join a student ice skating class with personalized coaching for a negligible fee. A few years ago I was suffering from hip and knee pain, was diagnosed with arthritis and got sent to physical therapy. There I was forbidden to continue running, at least until the pain and swelling in my knees went down—and possibly forever. When I complained about this sad fate to my child’s preschool teacher, she suggested I take the ice skating class she also teaches, on the theory that it’s a no-impact sport that uses lateral movement to build leg and hip strength. I’m from Texas, where my only exposure to ice was in drinks, so I was an utter beginner at skating. And on my first trips to the rink, I noticed that there were few people over 30 on the ice, and that the skaters who were as old as me had years and years of experience behind them. The few adults skating were clearly the result of a selection process that discouraged the inept. I braced myself for a steep learning curve. I was a slow learner, but with a patient and encouraging teacher, the process was addictive. I don’t jump or spin (yet), but I’ve gotten good enough that I don’t worry about falling. I can do crossovers and 3-turns, swing rolls and spirals. Lynne Tirell has written about the discipline demanded by ballet, and I’ll cop to becoming obsessed with the school figures that are no longer a compulsory part of competition because TV audiences couldn’t stand the tedium. Skating is the most cerebral sport I’ve ever tried. If my body is tired, I can still skate; if my mental focus is off, there’s no hope. First, there’s relearning the laws of physics. And then, like dance, there’s keeping track of where all the body parts are in 3-dimensional space. Early on, I thought that if I could just learn to skate forward and backward, I’d be well on my way to mastery. But no—each move has to be learned individually, for inside and outside edges, forward and backward motion, right and left foot. Eventually, I’ll worry about intangibles like grace and creative expression, too. Skating requires—and builds—strength, flexibility, balance, and aerobic fitness. More than those, it’s the cumulative skill set that opens up new ways of moving on the ice. For me, that deep range of skill separates skating from a sport like running. It adds to the challenge and, therefore, the attraction. Learning a new move feels much more like training my brain than training my body. I’m lucky to have access to a rink and a teacher, which would be expensive if I weren’t working at a university that keeps the ice frozen year-round. The cost of the equipment for skating is not prohibitive, but the cost of access is—as it also can be for swimming, golf, or downhill skiing. And skating fits perfectly into my daily academic schedule, since I can do it on campus, without needing to change or shower. Learning to ice skate as an adult is rare but worthwhile. It seems different from learning as a child. After years of running and biking and sitting at my desk, skating has revealed poor biomechanics, posture, and strength imbalances. The perception of risk is different, too. My knees feel fragile, and I’m more cautious about falling than my younger class peers. (And the risk is real: every semester, it seems, someone falls, breaks an arm, gets a concussion, is carried off by EMTs.) But at the same time, the speed I can get on ice skating blades and the awareness of risk provide a rush that I can’t get from running or yoga. The gender dynamic can’t be ignored. 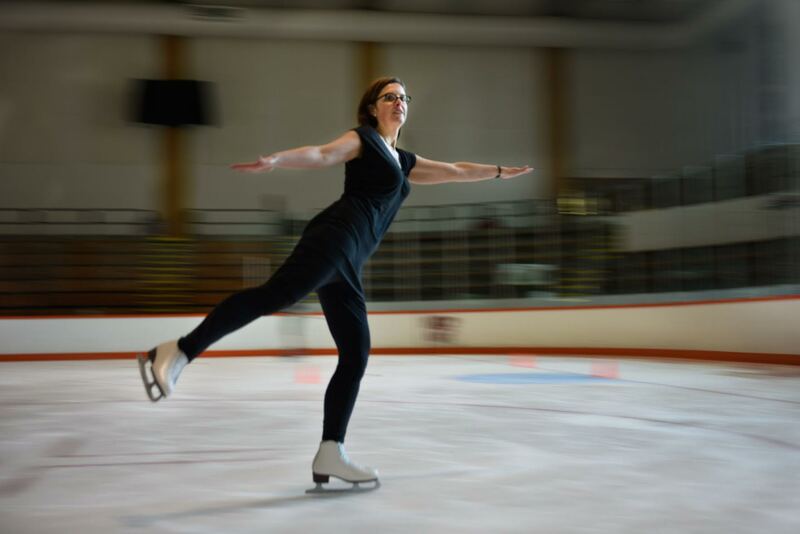 For a long time, I was just skating—sometimes on hockey blades and sometimes with figure skates. Hockey skates are faster and more maneuverable; figure skates are more stable but permit greater precision at slow speeds. Only recently have I needed to choose to pursue one style rather than the other. I’m not attracted to playing on teams, so that was the deciding factor. My university has a highly ranked women’s hockey team, but even so, on any given day, the number of men on hockey skates is greater than the number of women, and only rarely does a guy show up wearing figure skates. At the same time, there are guys who don’t play hockey and are devoted to working on tricks and moves that would be best done on figure skates—but they don’t want to be perceived as figure skaters because of the gender overtones. If I had a young daughter who wanted to figure skate, I would have serious reservations about the gender-conformist costumes and moves. A few years ago I would not have thought that ice-skating would be a sport I would seriously consider. Hockey seemed too aggressive and figure skating too, well, feminine. I didn’t like the thought of taking time for something I was not already somewhat good at. (At least good enough to stay off the ground!) 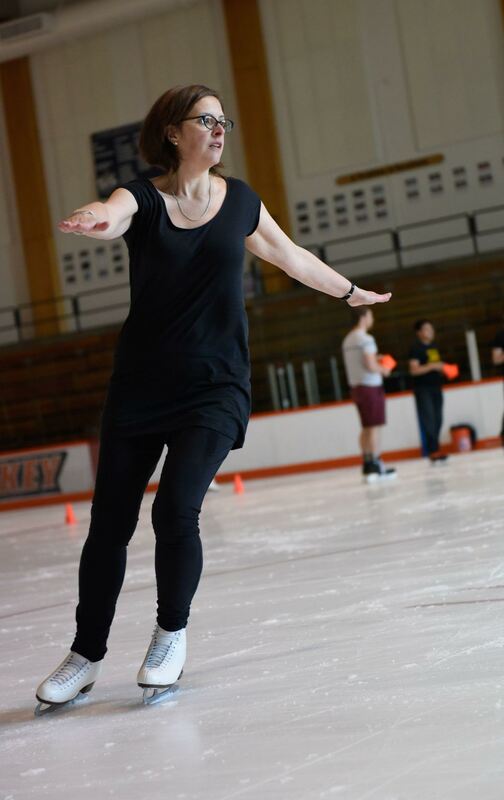 Although good skaters look graceful, I was skeptical that, starting as an adult, I could become that accomplished. As a feminist, I should have known better than to buy into these doubtful presumptions! I enjoy skating, and I enjoy how my body feels because of the skating. Skating feels like flying. The absence of friction on the ice is freedom from the constraints of ordinary physics. Evelyn Brister is an associate professor of philosophy at Rochester Institute of Technology. Her research areas are philosophy of science, social epistemology, and environmental decision-making, and she has recently been working on integrating applied critical thinking throughout the university curricula. A passion for ice has not displaced a passion for trees, so walking in the woods still figures highly in her universe.